I know it's been a long time since I've put out a newsletter. Things get so busy running Pioneer's daily work that it's all too easy to never get around to it. I decided it was time to make it a priority because there are some things I have been wanting to share with you. Have you ever received an online video from a client with no download options? How in the world can you possibly play it in your transcription software? Enter Total Recorder. This is a great tool for every transcriptionist's toolbox. There are four editions to choose from: Standard, Professional, VideoPro and Developer. For our purposes the Standard edition works just fine and it is less than $20.00. As many of you know, my friend and colleague Janet Shaughnessy had written the Zoom Transcription Course. She has recently totally revamped the entire course and now it is called Transcribe Anywhere. I am just blown away by the new format. It is now a complete multimedia course! It includes screencast tutorial videos, a transcription style guide, seven levels of practice dictations (with answer keys), how to find work, and so much more! How I wish there had been a course like this when I started in the biz 25 years ago. I could have avoided a lot of mistakes and been earning an income a lot quicker. The best part is she is offering a free mini-course! You've got nothing to lose and everything to gain by taking this course. The start of a new year is a great time to take that step towards an independent lifestyle and the career you've been wanting to have. Check it out right away at Transcribe Anywhere. Each issue we are going to spotlight somebody who is working as a transcriptionist by conducting a short interview with them. This month’s interview is with Jessica Cox. Jessica is another one of our wonderful transcriptionists here at Pioneer Transcription Services and we are happy to have you all get to know her a little bit. How long have you been a transcriptionist? Jessica: I have been a transcriptionist for the past seven years. Jessica: I graduated college as a Court Reporter, but moved to an area where court reporters weren’t really needed. So I landed a job at a local hospital, transcribing doctor reports for all sorts of radiological procedures, as well as oncology. 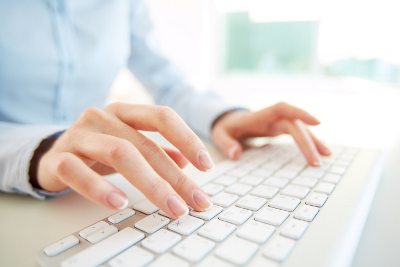 What type of training do you have as a transcriptionist? Jessica: I have my degree for court reporting, which gave me the education I needed for grammatical rules, et cetera. I also have on-the-job training in the medical transcription field. Why did you start working at home? Jessica: One year after working at the hospital, I became a mommy and decided to find work from home doing transcription so that I could be a full-time, stay-at-home mom. What is your biggest reason for working at home? Jessica: I work from home because it enables me to be a homeschool teacher to my children and be available to them 24-7. I feel my children are the most precious gifts I’ve ever received, and it is my job to be there for them to teach them about God and life. I want these precious few years I get with them to be the best I can give of myself for them. Do you work for transcription companies, have your own clients or both? Jessica: I work for a transcription company. Jessica: I usually get up around 4:30 a.m. and read my Bible and pray. I then do as much transcription as possible before preparing lessons for my children’s schoolwork that day. After school is done and the kids are playing, I do as much transcribing as I can until dinner time. Sometimes I go back to transcribing after the family is all fed, bathed, and asleep. What is your favorite piece of transcription equipment? Jessica: My favorite piece of transcription equipment has to be my foot pedal. Jessica: The best thing about my job is the fact that it gives me the ability to be everything for my kids. I am on my own schedule, which makes it possible to do homeschool, travel with my husband when he is on business trips, go out of town for the holidays, et cetera. I can do anything I desire and still take my work wherever I go. Jessica: I do wish I made more money, but it is a sacrifice I choose to make because of the fact that I choose to do homeschool. I am simply not as available as I would like to be. In turn, making less money than I would like. What advice would you give to somebody trying to break into the transcription field? Jessica: I would advise someone trying to get into the transcription field to really learn their grammar and punctuation rules. A lot of people think transcription is just typing what he/she hears. It really is more than that. There are rules to follow regarding grammar and punctuation. Not only that, but each “field” of transcription has its own terminology. Study up on different types of terminology. People tend to think that there is no brainwork involved in transcribing. It is quite the contrary. You have to think. You have to know how to punctuate and why. Those rules have to be second-nature to you.